There is a commonly held view that eating disorders are a lifestyle choice. 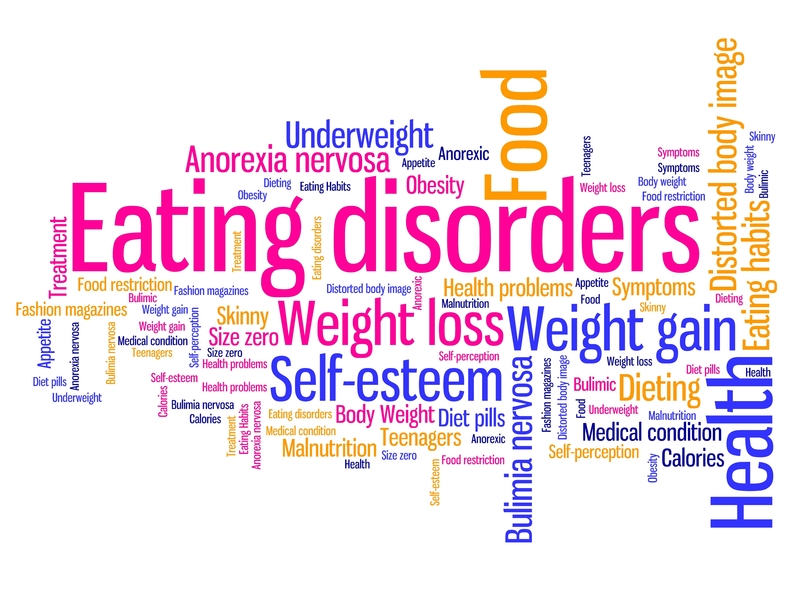 Eating disorders are a serious and often fatal illness that causes severe disturbances to a person’s eating behaviors. Obsessions with food, body weight, and shape may also signal an eating disorder. Common eating disorders include anorexia nervosa, bulimia nervosa, and binge-eating disorder. People with anorexia nervosa may see themselves as overweight, even when they are dangerously underweight. People with anorexia nervosa typically weigh themselves repeatedly, severely restrict the amount of food they eat, and eat very small quantities of food. While many young women and men with this disorder die from complications associated with starvation, others die of suicide. In women, suicide is much more common in those with anorexia than with most other mental disorders. Individuals with binge-eating disorder lose control over his or her eating. Unlike bulimia nervosa, periods of binge-eating are not followed by purging, excessive exercise, or fasting. Individuals who suffer from binge-eating disorder often are overweight or obese. Eating disorders frequently appear during adolescence or young adulthood but may also develop during childhood or later in life. These disorders affect both genders, although rates among women are higher than among men. Like women who have eating disorders, men also have a distorted sense of body image. For example, men may have muscle dysmorphia, a type of disorder marked by an extreme concern with becoming more muscular. Cognitive Behavioral Therapy (CBT), Dialectical Behavior Therapy (DBT), and Family Based Therapy (FBT) have all been proven to help in the treatment of eating disorders. Adequate nutrition, reducing excessive exercise, and stopping purging behaviors are the foundations of treatment. Explained by another medical or mental disorder (“If we treat that issue, the eating problem will go away”). Like other eating disturbances, there is no singular cause of avoidant/restrictive food intake disorder (ARFID). However, the evolving scientific literature suggests that this pattern of disordered eating develops from a complex interplay between genetic, psychological and sociocultural factors. Eating disorders are familial illnesses, and temperamental traits predisposing individuals toward developing an illness are passed from generation to generation. Obsessive compulsive features tend to accompany eating disturbances, as do co-occurring mood and anxiety disorders. Cultural pressures to eat clean/pure/healthy as well as growing emphasis on food processing, sourcing, packing and environmental impact can influence food beliefs and intake. Symptoms of avoidant/restrictive food intake disorder (ARFID) vary widely, and may evolve with the developmental context of the individual (especially in children and adolescents). Adult ARFID : Individuals with avoidant, aversive, or restrictive types of ARFID presentations beyond childhood; may have had similar symptoms since childhood including selective or extremely picky eating, food peculiarities, texture, color or taste aversions related to food. If left untreated, ARFID symptoms can build in intensity and seriousness, which is especially concerning for children and adolescents going through the most developmentally important stages of their life. Weight loss or being severely underweight. Nutritional deficiencies (e.g., anemia or iron deficiency) and malnutrition that can be characterized by fatigue, weakness, brittle nails, dry hair/hair loss, difficulty concentrating, and reduction in bone density. Growth failure in adolescents or an increased risk to not thrive. Many sufferers have stunted growth or have fallen off their growth curves for weight and height. Many behavioral and psychological interventions have demonstrated promising effects for those recovering from ARFID and may include forms of exposure therapy, cognitive behavioral therapy and more. Because underlying biological factors may influence ARFID, seeking out specialized care by a treatment team should be sought for full assessment and diagnosis. This may involve collaboration with a speech language pathologist, occupational therapist, physical therapist, and registered dietitian. If you suspect that someone you care for may be suffering with a form of ARFID, it is important to express these concerns to a treatment specialist. A disturbance in eating patterns is not something that should be ignored, and seeking out treatment early can assist with intervention and recovery. Often associated with psychiatric co-morbidity, especially with anxious and obsessive compulsive features. More than just “picky eating”; children do not grow out of it and often become malnourished because of the limited variety of foods they will eat. Boys may have a higher risk for ARFID than girls. BDD is typically seen first in teens and pre-teens, around the age of 12, and it affects both men and women equally. In the United States, body dysmorphic disorder occurs in approximately 2.5% men, and 2.2% women. Although more research is needed, BDD is thought to be both biological and environmentally developed. Some research has shown genetic predisposition, neurobiological factors, personality traits, and life experiences such as abuse and trauma can have an effect on the development of BDD. Even though BDD affects a rather small amount of the general population, it can be seen with eating disorders. Frequently many individuals who struggle with eating disorders have low self-esteem and poor body image . BDD can develop along with an eating disorder. Spending an excessive amount of time in front of the mirror , and engaging in repetitive and time-consuming behaviors.